"These are awesome! Straight out of Brooklyn is the Coney knish with a flaky crust and filled with potato, fried onion, and yes, hot dogs. These tasty treats are very popular in Brooklyn kosher deli and take out places. Sometimes I'll cut each one into 3 or 4 pieces before baking and serve them as a hot appetizer. Serve with a side of spicy brown mustard for dipping." Place potatoes into a large pot and cover with salted water; bring to a boil. Reduce heat to medium-low and simmer until tender, about 20 minutes. Drain and transfer to a bowl. Mash potatoes using a potato masher or a fork. Heat oil in a skillet over medium heat; saute onions until golden brown, 10 to 15 minutes. Mix potatoes, salt, and pepper into onions. Remove skillet from heat and cool. Roll each puff pastry sheet onto a work surface. Cut each sheet into 4 squares. Spread about 1/4 cup potato mixture onto each square in a strip down the middle; top with a hot dog. Cover each hot dog with about 1/4 cup more potato mixture. Roll puff pastry around hot dog and filling; place, seam side-down, on the prepared baking sheet. Brush puff pastry with egg. Bake in the preheated oven until golden brown, 10 to 15 minutes. 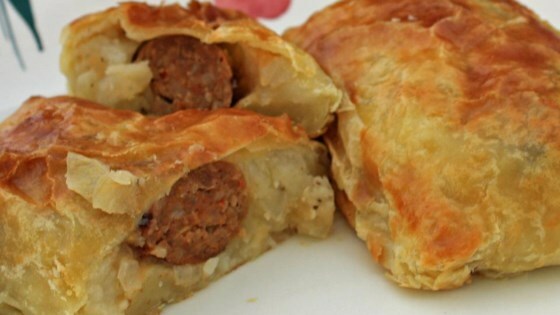 I made these with Johnsonville Hot Italian Sausages and the Knishes turned out amazing! Very Good! I had a hard time getting pictures as they disappeared in minutes. I made these with some left over mash potatoes and they were delicious.